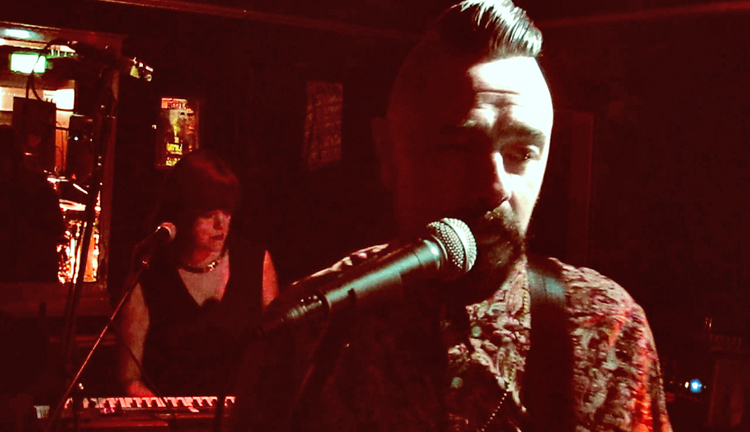 Vagus on form with new songs and a few faves. 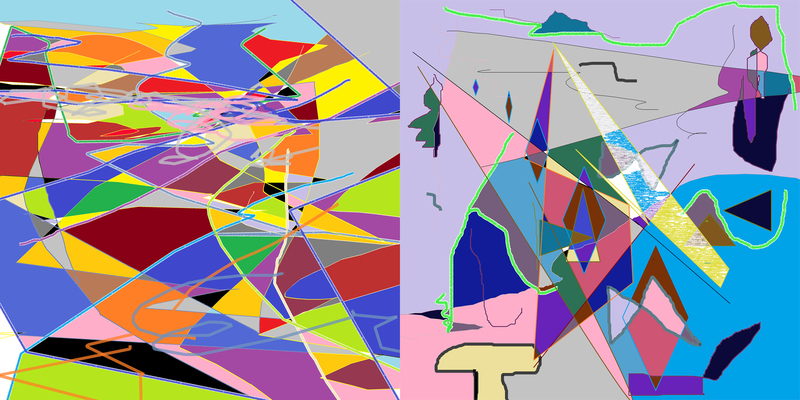 Alice Gee, Gary Law, James Dolan and Jonny Hill are a new wave krautrock quartet with pop tones and avant-garde sensibility. The music on this live EP comes from the full-length concert film we published in March 2017, with a heavy sound wrung from the tapes by producer Gary Law. 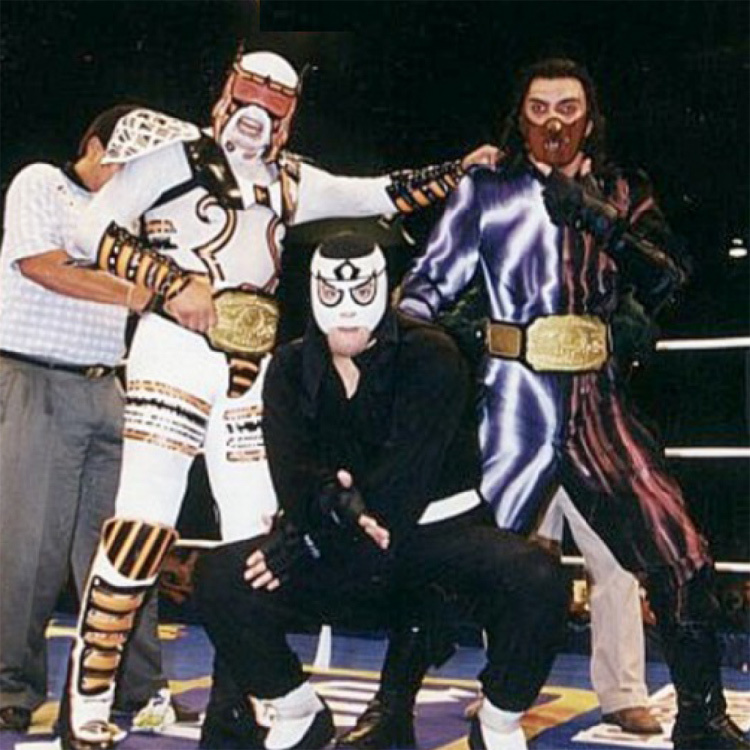 Let’s recap some major moments in the recording history of Vagus. Gutsty was a prototype punkoid classic, and then the first commercial release Electro Looks a pop song with electronic rhythms made while technically still a duo. AK-47 was next, with Gary Law overseeing construction of a techno armature for prog-inspired darkness. Jersey Live 2015 with Par 4 stage, mixed by Sam Falle, was rock ‘n’ roll spectacle and an explosive live debut. A recording done at the Mechanics venue captures a ferocious version of Tokyo, often a set climax. Soon the band will record and a classic album will be born. We will wait and listen for the droning, for that will be the beginning, and figure and ground will coalesce as eyes and ears find their perspective in a musical framework that expands the potential for European art-jazz approach to improvised sections within quintessentially British pop compositions. 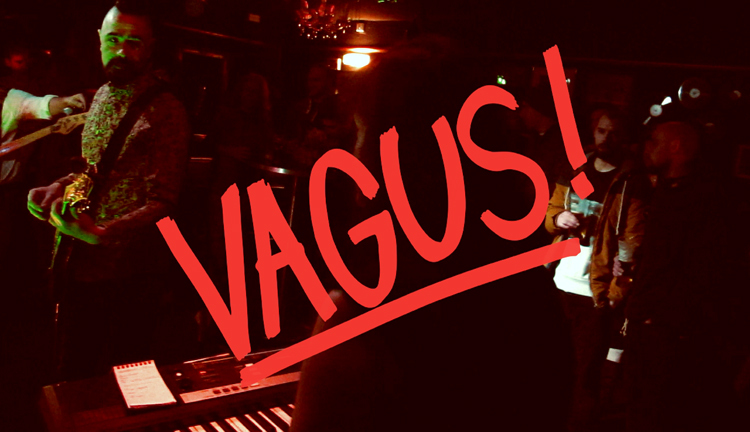 Follow Vagus on Facebook for the latest news and dates. 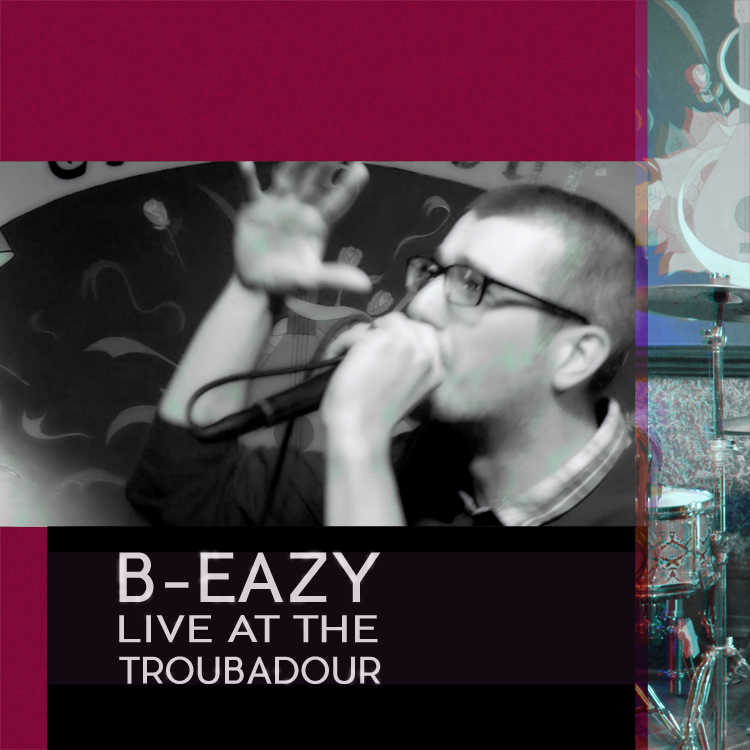 We proudly present B-Eazy – Live at the Troubadour. Enjoy the video. 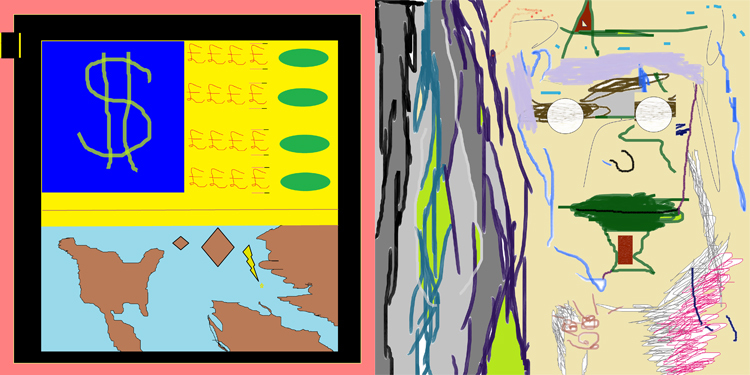 Bonus material below: A potted guide to United Elementz releases. B-Eazy has been an effective, positive force on the Jersey music scene for a decade. 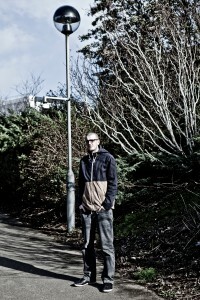 His stock-in-trade is old skool-infused hip hop with sophisticated lyrics and dazzling metrical dexterity. B-Eazy will be releasing his new EP, Sienthe, in early 2017, the title of which is a combination of his two daughters’ names, Sienna and Zanthe. Sienthe is being produced by Kenyan-born and Jersey-based producer J-Fab. 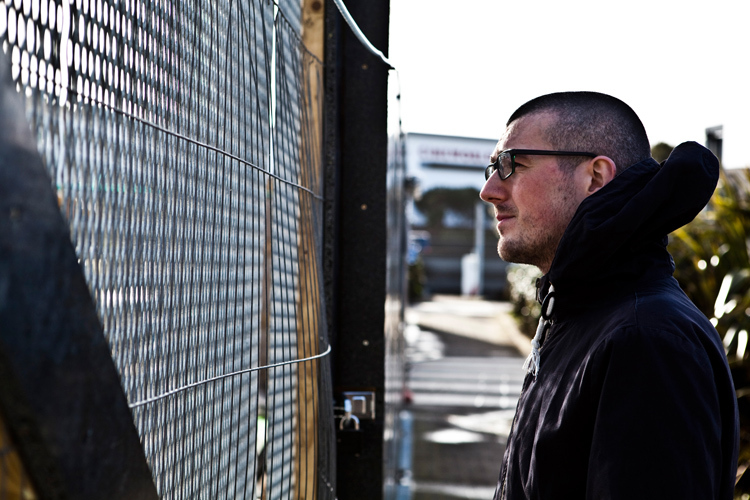 Since 2015, B-Eazy, also known as Bean Lebouc, has achieved a steady output of digital releases via Bandcamp in association with United Elementz the hip hop brand that he established with graffiti artist SAO 2971. BeanDOOM (2015) with FabSound Productions is an ambitious pairing of MF Doom instrumentals with Bean’s philosophical musings and poetry jam pyrotechnics. United Elementz Present Suicide Rock: An Introduction to Hip​-​Hop in Jersey was the next release, also in 2015. With this compilation, executive producers B-Eazy and SAO 2971 recruit an impressive who’s-who of Jersey hip hop past and present. Classic tracks by Eddy West, BJ Myles, Just Muz, J-Fab, Verse 1, U.G, Kinz, MOLE and others make for a substantial collection. United Elementz are shining light on one of the most outlying communities of hip hop, an island mostly known for its cultivation of corporate finance and corresponding economic inequalities. The group release presents a fresh-feeling, small, well-connected hip hop community doing its thing with pride and passion. Eddy West’s album Hurt (2015), produced by Eddy and DF1, is a joint Revolution Records and United Elementz presentation. Supple vocals with an inventive, luxurious club production deliver Eddy West’s contrasting attitudes of arch belligerency and attraction to the lusty side of life. Real, gritty and powerful sums it up. The 10​-​Year Plan: 2006​-​2016, an anthology that is far-ranging in its collaborative breadth and stylistic palette, a concept album that achieves in the time-honoured way a biography as origin story with the rapper as faithful hero in adversity, celebrating the rewards of working and loving well, respecting life and others and the gifts of talent. B-Eazy is innately sharing in his work ethic with personality and determining vision that comes through clearly. Cobwebs (2017): an exotically constructed album threaded with tales of both confusion and clarity, huge hooks and ironic pop sensibility. The single Oh No! was aired on Radio Wigwam’s BANDWagon show, and the album got to No. 1 on Bandcamp’s Alternative Rap album chart. Eirenicon and B-Eazy share vocals throughout, Mad Max guests on the excellent noirish thriller Blurred. Announcing a series of Bubblebrain’s Hot Picks, our serendipitous discoveries of musical talent across the stylistic spectrum in and around St Helier. First up we have Carl and the Converted, a trio with a full songbook of vintage rock ‘n’ roll and the easy swinging feel of a 1950s house band at Sun Studio. 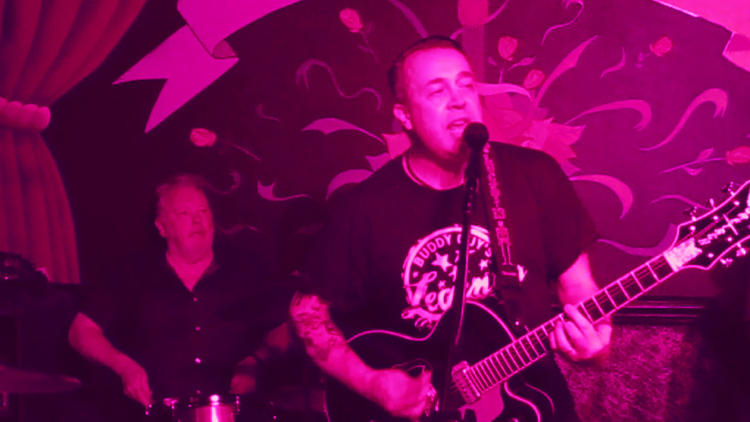 Twelve songs from the band were recorded that evening, the six songs featured in the video and another six from later in the set, capturing a relaxed atmosphere in warm, grainy detail with the musicians hitting their stride. All are available to stream and download from Logamp. Riq Chiznik makes improvised jazz and blues with electronics and a lot of fantastic inspiration. Riq’s sounds inhabit ambient spaces, dissolve into disordered noise, and expand into flamboyant neoclassical mutations. We selected twenty of his pieces and made this long-form mix. Riq’s instrumentals are brimming with extraordinary inventions and much warmth and wit amongst the dense sonic foliage in this 1 hour 19 minutes of cartoon colour-saturated jazz, ambient bloopscapes and crispy synth manipulations. The 3-song EP contains the single version plus two specially commissioned remixes. likeallstars’ version of the surrealistic pop song matches the oddity of the original, going far out there. 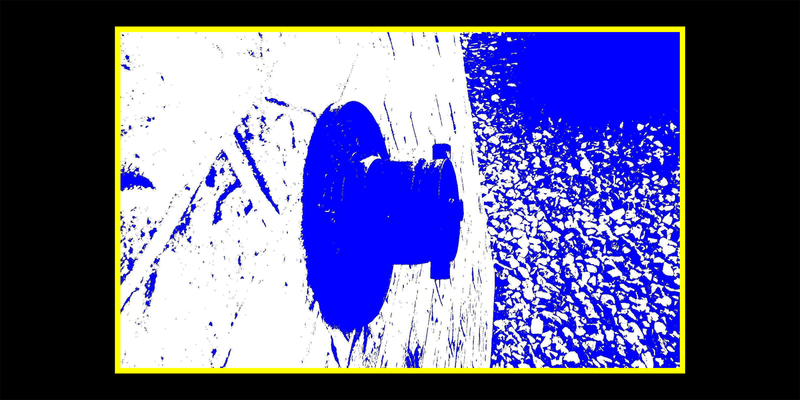 A delightful remix by Lux Flux in the seldom-explored weaselwave music genre. 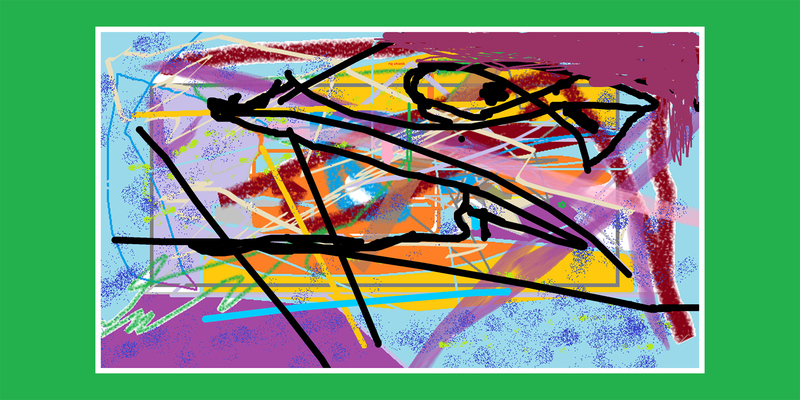 The version has quirky atmosphere and synthetic animal calls! The catchiest pop song ever written about nargling in the ears of wizards. Check out Riq’s Bandcamp page for the latest releases. The Green Rooster is a music venue in St. Helier that supports live music by fostering relationships and indulging creativity. Stefan Riccio and Dom Pallot are Semu Cà, a duo from Jersey who perform using two loop pedals, bass, guitar, trombone and various other musical gadgets to build voluptuous soundscapes. They exemplify the fascinating underground scene of Jersey with a diversity of forms and influences bubbling up. 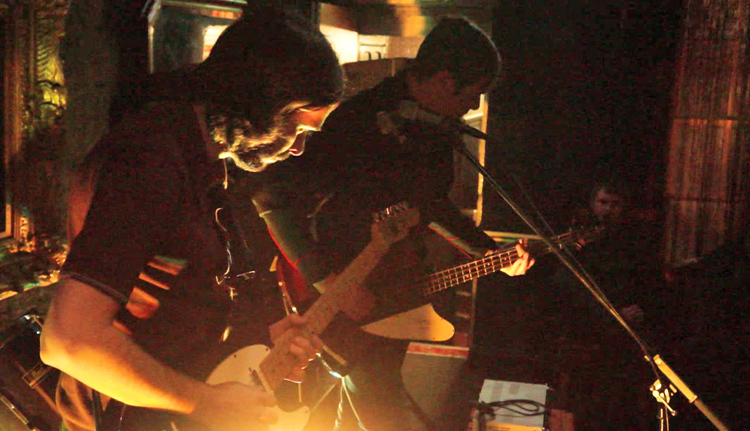 The musical style is rousing post-rock electronica with jazz and punk influences. This is a very cool band to experience live on stage. Watching this is the next best thing! 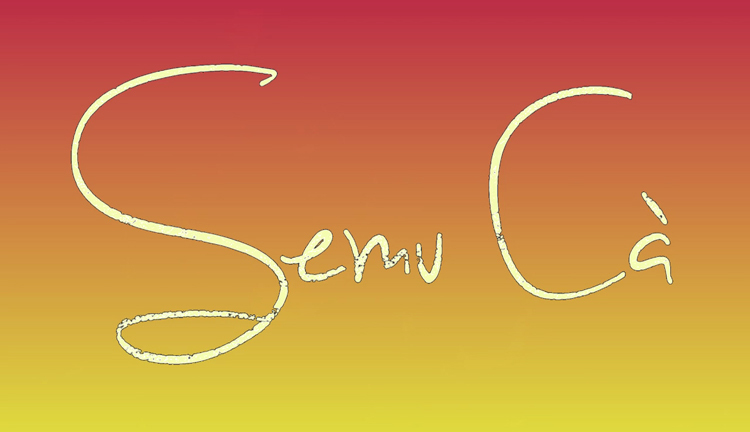 Semu Cà mix their own sound live on stage. Bubblebrain Records recorded the audio with a Zoom stereo field recorder and also with an analogue tape deck. 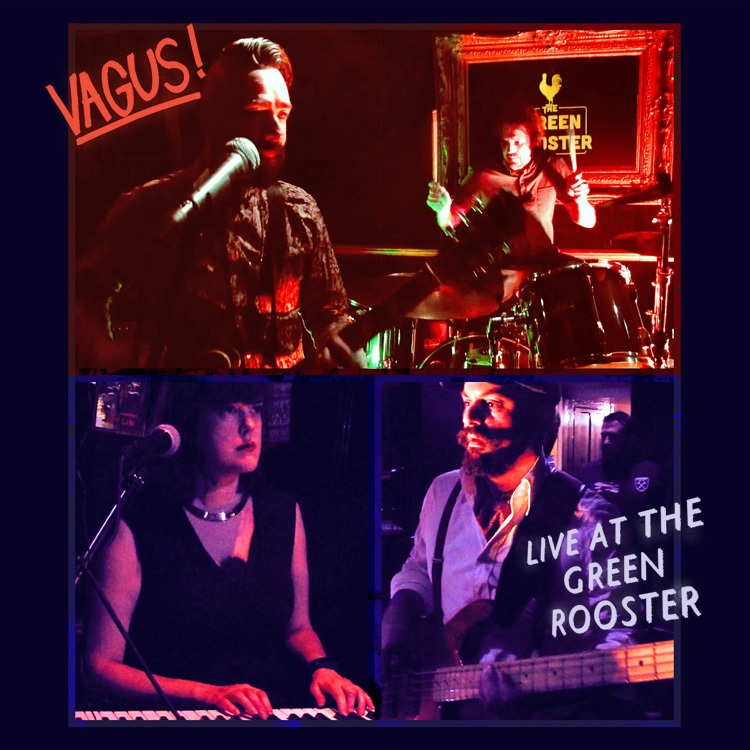 Vagus on fine form with new songs and a few faves. Alice Gee, Gary Law, James Dolan and Jonny Hill are the new wave krautrock quartet with pop tones and avant-garde sensibility. This is a great set from them, for reasons: They included three songs we hadn’t captured on film before (Leisure, Gravity, and We Were Falling in Love). The audio quality surpasses live recordings we’ve done to date thanks to Gary and his new recording kit. Let’s hear it for #therealvagus and enjoy the show! B-Eazy aka Bean Lebouc is a hip hop artist from Jersey, Channel Islands. He has been releasing music and performing live since 2006 having started recording in 2000 making mixtapes to get feedback from his friends at school and college. He has performed at many established events including Jersey Live 2012 with U.G, BLKOUT 2015, and the BBC Introducing Masterclass in 2013 at Maida Vale Studios where he got to perform with a live band as a part of BBC Radio 1 DJ Charlie Sloth’s Live MC Session alongside Wretch 32 and Devlin. He has also supported artists such as Stig of The Dump, Blizzard, Miss Dynamite, English Frank, Mr. Woodnote, and DJs Grooverider, Kissy Sellout, James Zabiela and Mike Skinner (The Streets). 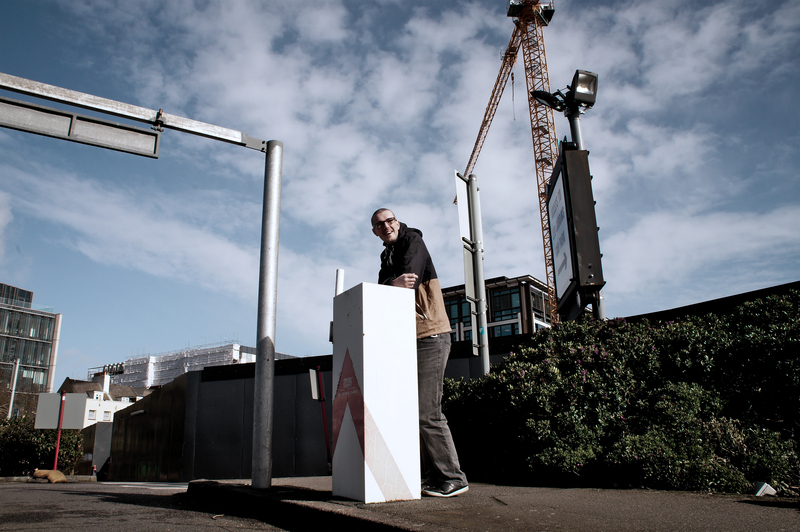 In 2014 he set up United Elementz alongside graffiti artist Vince Talcone (SAO 2971) to promote local urban talent in Jersey and promote the four elements of hip hop culture. United Elementz has reached people from the UK, US, Africa and Australia as it continues to grow and push the culture as a whole forward. B-Eazy is also a member of DJ Stefunk’s Jersey Funk All-Stars band as an MC for their live sets which range from hip hop, jazz, funk and soul, and a mix show DJ alongside Reggae DJ Dubsoulvibe releasing the monthly Original Flavaz mix on TrunkOfunk Radio. B-Eazy is looking to continue to push not only himself but other artists through his teaming with Bubblebrain Records to help gain under-the-radar urban artists the recognition they deserve. 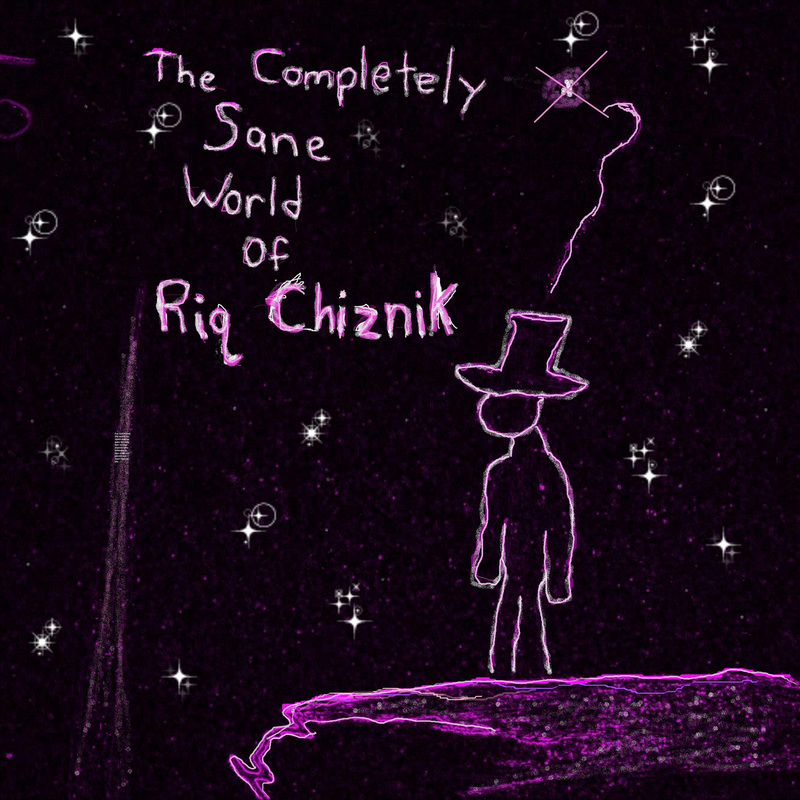 The Completely Sane World of Riq Chiznik, an album of twelve weird and wonderful songs by Illinoisan music producer Riq, comes in its Bandcamp edition with a beautiful e-book of art reproductions, lyrics sheets and other writings. The GIF below shows in miniature the book’s contents with its expressive use of colour and forms. 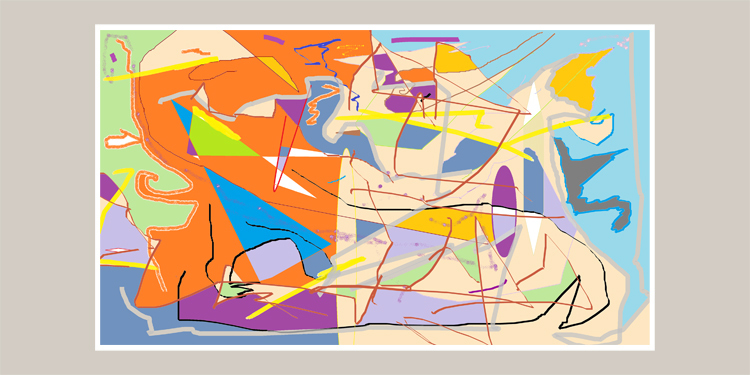 Riq Chiznik’s graphic work informs the music-making process and vice versa. There is something about the cartoony abstractions of Riq’s colourful art that hangs together with the music. 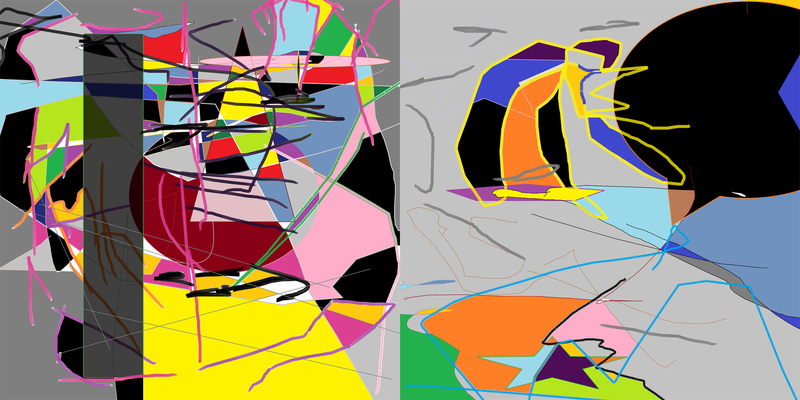 Discoveries in one medium are translated in the other. 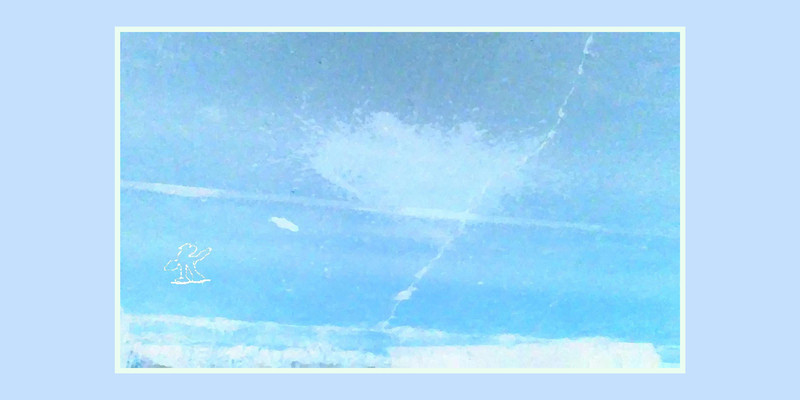 When listening to a Riq Chiznik piece, one hears a rich stew of influences – condensed ragtime quotations, dust bowl freak blues, free jazz, the furniture utility of Brian Eno’s ambient music, the hallucinatory yarns of Captain Beefheart, the fragmented storytelling of Bob Dylan at his most stoned, the imagery of 20th Century experimental American film and art, the vivid splatterings of Jackson Pollock, the mystical comic book impressions of Don Van Vliet (again! 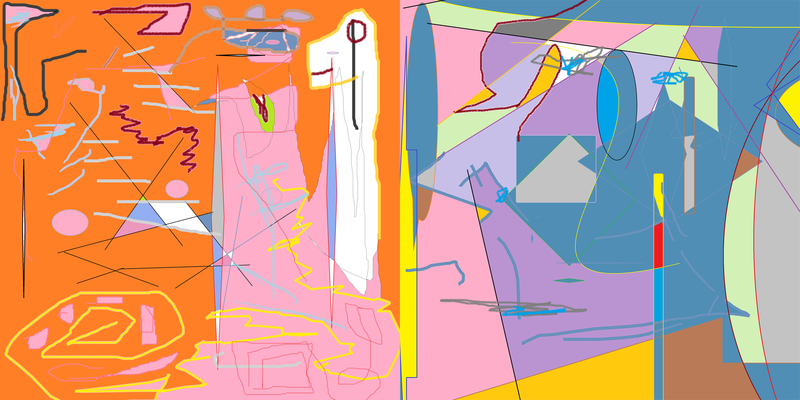 ), the delirious unconscious associations of Dalí, the jumbled, nervy neo-expressionism of Jean-Michel Basquiat, all animate Riq Chiznik’s visual and musical inventions. Here is a selection of pages from the book. 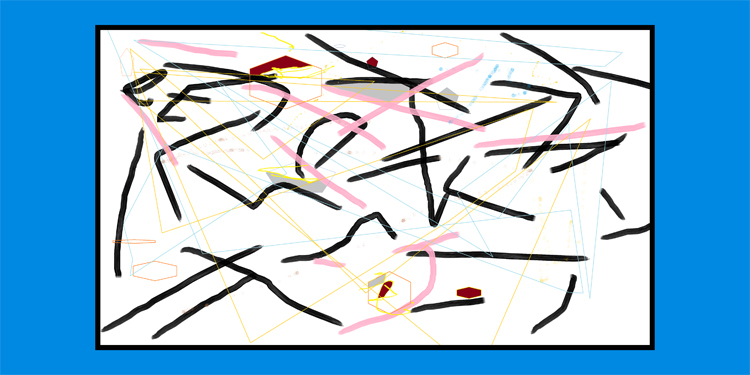 Click on the images for larger size. 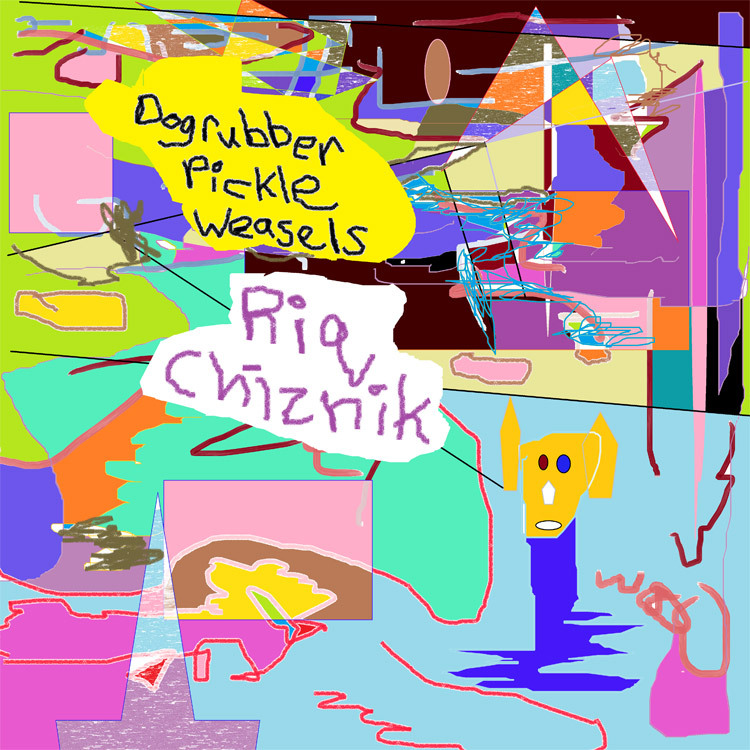 Listen to Dogrubber Pickle Weasels (Single Version), a surrealistic lounge jazz song serving as introduction to the bizarre yet friendly sound of Riq Chiznik. This song is also available on an EP with remixes by Lux Flux and likeallstars. 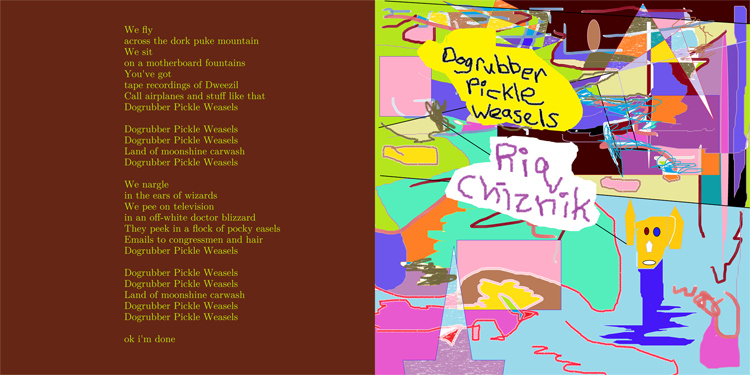 Twelve songs of experimental comedy, avant-garde electronica and subversive songsmithery. The Bandcamp album package exclusively includes a 37-page e-book of original art and lyrics.